ISR is coming to Tavares, FL! Senior Master Instructors, Lisa King and Katie Mercadante will be teaching lessons in Tavares, FL, providing ISR Self-Rescue™ lessons to families in the area. support of the Tavares community! Join us at this indoor, heated facility! Brian Maucere has been working with children since 1993. He has over 7 years experience as a firefighter and EMT, and has even worked in Iraq for 15 months as the Education Coordinator and New Hire Instructor for contract firefighters. Brian now owns and runs U R CrossFit in Trinity, FL. with his wife Amanda. "They say you always come back to what you love. So it is no shock that I am doing essentially the same job I had as a teenager. Everyday, I have the unique opportunity to touch lives and help people reach their fitness goals. 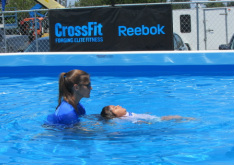 I bring nearly 20 years of instructing experience and my determination to protect children to Infant Swimming Resource." We are excited that Brian is joining the ISR Team! Shalene is a certified Crossfit trainer and assistant coach for the Crossfit Kids program out of Crossfit Asheville in Asheville, NC. She is also a founding board member of and interim movement teacher for a Waldorf-inspired school in Asheville called the Azalea Mountain Cooperative. She is passionate about helping children overcome their fears and gain the strength and confidence they will need to face any challenge they are presented with. This desire naturally led her to interest in the Infant Swimming Resource program where she believes she will best be able to help children to discover the inner capacities they will need to be strong, successful, and empowered with skills.